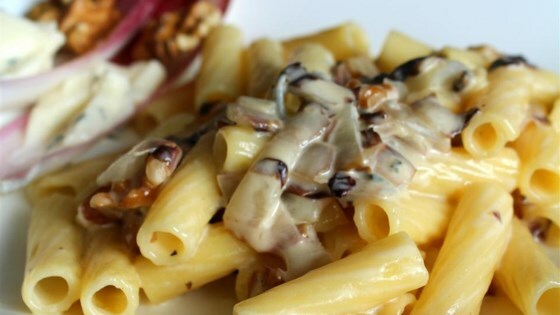 "This rich and flavorful sauce is the perfect match for bitter radicchio. It is incredibly easy to make and goes well with any type of (preferably fresh) pasta. My favorite pasta to have this with is gnocchi. The light and fluffy potato pasta goes well with the rich sauce. Garnish with Parmesan cheese and parsley." Heat olive oil in a skillet over medium heat. Add radicchio; cook and stir until softened, about 5 minutes. Transfer radicchio to a bowl and cover with plastic wrap so it continues to wilt. Pour heavy cream into the same skillet and bring to a simmer over medium heat, about 5 minutes. Add chunks of Gorgonzola and whisk until melted and evenly incorporated, about 2 minutes. Season with nutmeg, salt, and black pepper. Stir in radicchio. Add gnocchi and toss to coat. Use caution when adding salt as gorgonzola can already be fairly salty on its own, and additional salt may not be necessary.